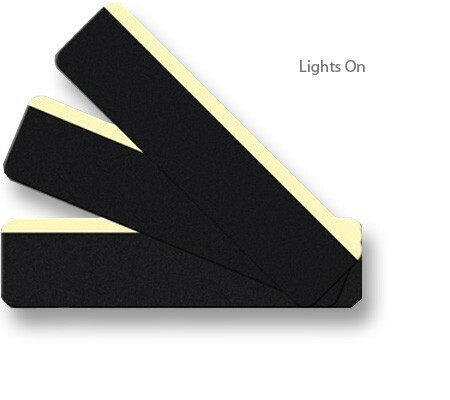 Package of 5, 24" x 6" non-skid, black, self-adhesive stair treads with a 1" photoluminescent accent stripe. These stair treads employ a long-lasting, pressure-sensitive adhesive film compatible with smooth finish surfaces to be used as part of a Low Level Exit Path Marking system. Low Level Exit Path Markings (LLEPM) are a relatively new type of Life Safety Improvement and consist of a mix of exit path markings at traditional heights and other markings located near the floor where they wouldn't be hidden by a layer of dense smoke descending from the ceiling and where they could be seen by someone crawling along the floor. They can provide life-saving exit guidance to all residents, employees and tenants during an emergency evacuation through dark stair wells even if emergency power fails.